Last year at this time I ran the Inspiring Hope 10k, after having trained since January and ran it in 1:01. I was a little disappointed in myself for not having finished in under an hour. I went into that race feeling strong, and had just run another 10k a few weeks previously so I knew what I could do if I had a good day. The time was 5 minutes faster than my previous race, but I still had some gas in the tank afterwards, so I probably could have pushed a little harder. A few days after that race, I hurt my hip and was out for a couple of months. I have not run more than a mile and a half without stopping. I’ve only been allowed to run for three weeks, and I have the ankle injury to contend with. Plus I developed a sore back the day before the race. I kind of figured I’d be doing a lot of walking. I woke up at 6:30 and got dressed in my running getup, including the compression stocking things that my Physical Therapist suggested I wear to keep my ankle from getting inflamed. Then I drove to the store to get milk and some cash to register for the race. After driving home, I walked over to the start / finish area, which was in the lunch room of Kamiak High School near my house. I jogged a short portion of the way just to check out the ankle and how it was feeling. It seemed fine so that was encouraging. The back was still a bit sore but not as bad as yesterday, which was also encouraging. Seemed to be the kind of thing that would shake out after running a bit. I got to the registration area, signed up and handed over my fee. They asked how fast I thought I would go, and since I didn’t really know they suggested I go with the second wave. I decided that was fine. I checked my jacket and swag bag, milled around the vendor fair, drank some coffee and ran into my friend W. Talked to her for a bit. Bought a new little belt thing to keep my phone in while I run. I even used it during the race. Sure, but it’s more fun to do my Charlie Brown teacher imitation! Pretty soon it was 9am and the first wave went. I had to wait until 9:05 for the second wave to start. As soon as it did I realized I was in the wrong wave. I spent a couple minutes running at a fast but comfortable pace and before long had passed almost everyone in the wave. I spent the rest of the race chasing down an older gray haired gentleman who was first in our wave, and a young couple running together (a brown haired girl in a ponytail and her male companion in a red Seattle Marathon shirt) who ended up being second and third. I ended up fourth but ponytail girl and her boyfriend were behind me for part of the middle section of the race. They caught me when I took a walk break at the water station at mile 2. The course itself is pretty easy for the 5k. Two small hills, one at the beginning and one at the end, the rest of the race is pretty flat. Most of the course has you running on wide sidewalks, with a couple of forays into the road. The whole thing is paved – no trails. The course is basically my regular running route, so as a first foray back into racing, it really couldn’t have been much easier. I had to leave before results came out, because my kids both had baseball games and also they were very eager to get to our town’s “Touch a Truck” display before the games, but I knew my time was somewhere in the range of 31 minutes, because it was 9:36 when I came across, and my wave took off at 9:05. I had to wait until Sunday to find out my actual time. Final race results said it was 30:48 total time, which brought me in 29th place out of 128 in the 5k, and third in my age group. For a first race back with almost no training, I thought that was a pretty great place to start. For two weeks our weather has been very foggy with no rain, and the weather report for today was supposed to call for clear skies this morning. So what do you suppose woke me up this morning at 6:45, two hours before race time? That’s right – pouring rain. I seriously considered rolling over and going back to bed but then I thought about my race fees, and how much I hate wasting money. And then I thought about how hard I had worked to get ready for the race and forced myself up and out of bed. Besides, I thought, if you are going to be a runner that lives in Seattle you simply cannot be the kind of person who backs out of races because of weather. And so, I got dressed, ate some oatmeal, drove through Starbucks for a latte, and arrived at my parking spot one minute before they closed the road. Given the change in weather I had to make some last minute changes to my race day attire. Out with the lightweight capri tights and in with the UnderArmour cold gear long pants. I opted to add a second lightweight jacket under my soft shell, to keep warm before and after the race. I also swapped out my lightweight running socks for wool, since if my feet had to be wet, I wanted them to at least be warm. Under my two jackets I wore my official race shirt, a blue long sleeved tech shirt. It got a real test today and it passed – I felt warm enough and dry the whole time. My parking spot was about a quarter mile from the start. Definitely worth the $10 to have guaranteed parking near the start and not have to ride the shuttle. On the other hand, I did have to arrive an hour before start time to use the parking spot. The best part was really after the race being able to go right to my warm car and straight home. I think the shuttle would have turned into a real hassle on the way home. I parked the car, drank all the water in my bottle (decided to pre-hydrate and not carry – when it’s cool I don’t usually feel the need to drink on the run), and chugged the rest of my coffee. Next thing, time to scout out the porta-potties. An hour before race time there was already a line about 30 deep and the potties were running out of TP. Not a good sign for later, so I decided to get that taken care of sooner rather than later. 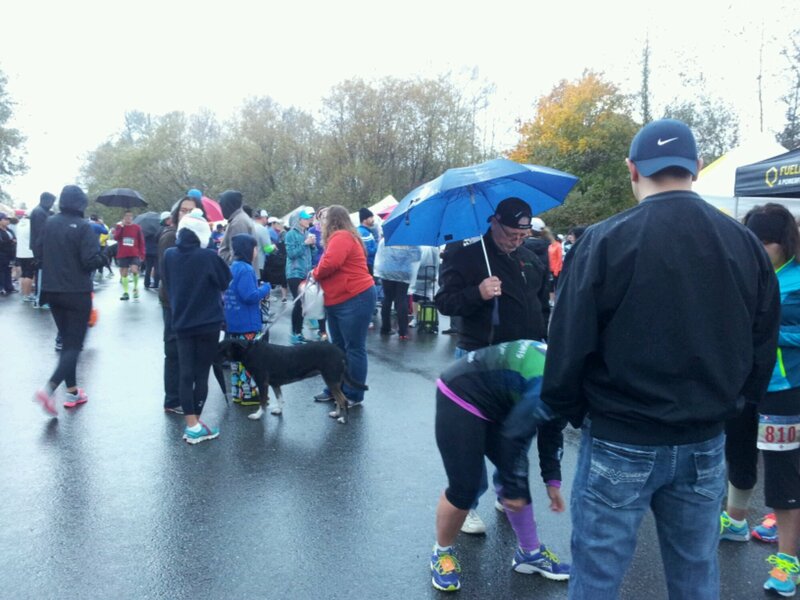 I walked a little further and arrived at the start, where everyone was milling around in the rain. I saw a friend from my gym who was going to run the half and wished her luck as they were calling half runners to the start, which began at 8:30. The 10k started at 8:45 and I was feeling chilly so I went to the coffee tent and got a cup just to hold on to. While I was standing there, a woman approached me and asked, “so where do the runners start? At the start line?” I politely answered yes, but it did take some self discipline to avoid telling her that they actually would start at the finish line and run in reverse. I considered taking a selfie but opted against. Did take a picture of runners standing around though. At 8:40, they called the 10k runners to the start. I wasn’t really sure whether I should be in the 10 minute or 9 minute pace corral. As I was training for the race, my big goal was just to finish in under an hour. That is about a 9:45 pace. I knew I could manage that pace – but I also thought of the advice I got from a friend on Saturday that said that if I wasn’t sore the day after, then I didn’t run hard enough. It is a race, after all. You’re supposed to go fast. So I opted for the 9 minute corral but since I wasn’t sure I’d be able to pull off a race at that pace, I stood towards the back. I did back off a bit after that but since I was feeling surprisingly okay, I didn’t back off too much – just enough to where I was breathing easy. At about mile 2 I started shedding layers, at which point I realized I had forgotten to take off the light jacket under my soft shell, which meant I would not have anything dry to put on at the finish. I was kind of bummed about that but decided to take it as a lesson for next time; I really need to write myself a note with things I need to do before the start since when I am excited I really can’t remember anything. It was an out and back course along the Snohomish River, so we hit the turnaround just shy of 3 miles. As we were running I noticed I wasn’t seeing many people coming back from the turnaround. I figured out I was toward the front of the pack. I couldn’t help but feel pretty proud of myself for that, so as we hit the turn I made all the ladies standing there give me a high five. Yay me – I’m now a front of the pack runner! 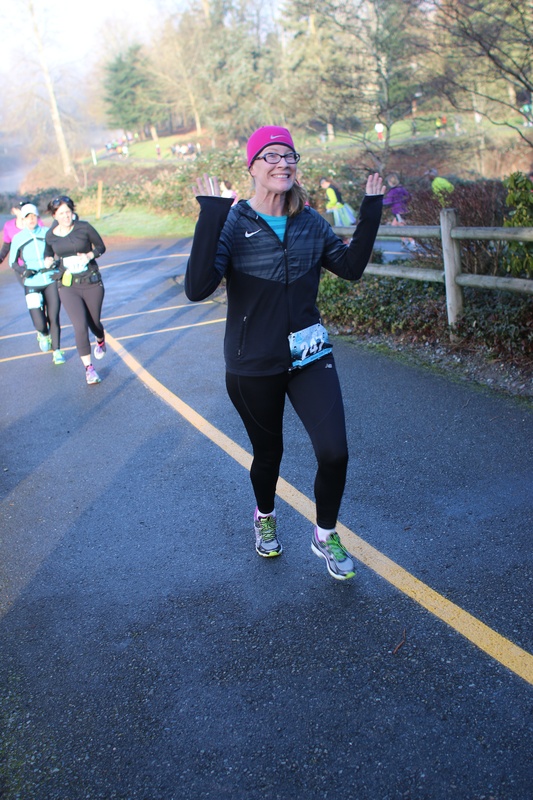 After the turn, the pace started to affect me more – the tightness I’ve been feeling lately in my shoulder started really burning, and some new tightness in my hamstrings and hips reminded me that I was at the edge of what I really could handle. I pushed myself to maintain pace anyway though. I had a couple of people that I just stayed with most of the way back. I enjoyed the course itself but I will say something that surprised me was the smell. It is riverbottom farmland that the course runs through and they must have had some cows around, because there was a definite odor of manure in the air. Didn’t bother me on the way out but on the return trip it did. I think I get more sensitive to smells when I am more tired. As we made the final turn towards the finish we passed the photographer and I was feeling good so I made some crazy face. Apparently, that sapped the last of my energy because I could not get my body to cooperate when I tried to kick it in to the finish. But I held my pace. I looked up and saw my family right before the finish, and then I saw the clock and realized I had run my race a full 4 minutes faster than I had expected. In spite of the rain, it was a pretty awesome race experience. 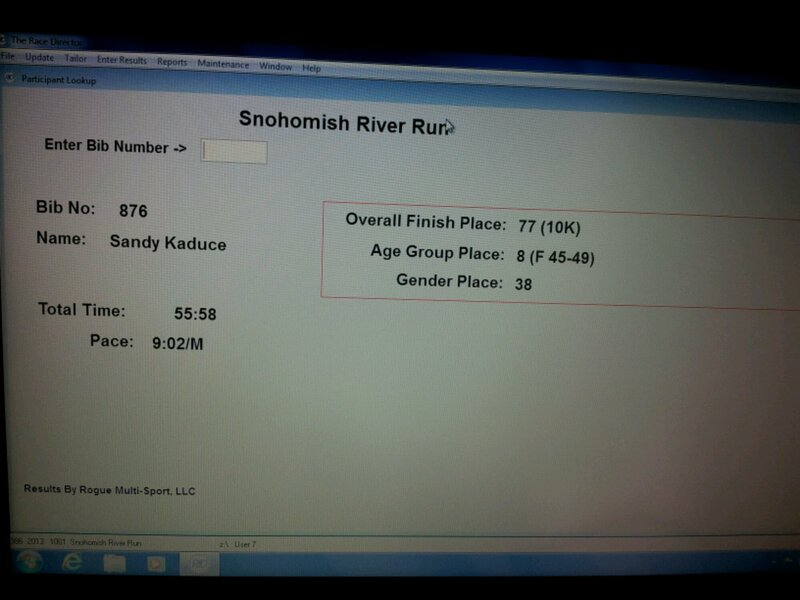 I ended up 8th in my age group and was very happy with how everything went.